This new book offers a unique collection of brief texts and annotations as well as an abundance of images, sketches, drawings, watercolors etc. by Friedman himself. It also features a vast range of documents related to his work. In part II, Manuel Orazi gives an analysis of Friedman’s oeuvre, based on extensive research. He follows the architect’s progress through disciplinary and geographic areas apparently remote from one another, in which Friedman has been moving erratically and incessantly. Orazi also expands on historical, social and political contexts. A documentation of Friedman’s intellectual relationships and other resources, an interview with Swiss architect Bernard Tschumi about Friedman, and a comprehensive bibliography round out the book. born 1923, studied architecture in Budapest. After having escaped capture and deportation from Hungary by the Nazis during World War II, he lived in Israel for nearly ten years where he completed his education at Technion – Israel Institute of Technology in Haifa, and also worked as a builder to earn his living. He has been living and working in Paris since 1957.
is an architect-researcher based in Geneva. He studied at the Academy of Architecture in Mendrisio, the Architectural Association in London, and the Universitat Politècnica de Catalunya in Barcelona. 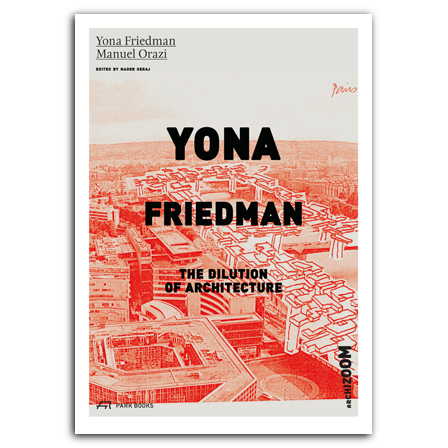 He curated the exhibition Yona Friedman: Genesis of a Vision at EPFL’s Archizoom gallery in 2012.
graduated in arts at Université Paris 8 in St. Denis in 1996. He has been appointed director of Archizoom gallery at Ecole Polythéchnique Fédérale de Lausanne (EPFL) in 2008.